While in San Juan, Puerto Rico for my 30th birthday I signed up for an excursion to hike thru El Yunque National Forest. El Yunque National Forest is a tropical rainforest. It is the only tropical rainforest in the national forest system. El Yunque is small in size, however it is the most biologically diverse rainforest of the nation forest system. It hosts hundreds of different animal and plant species. Some of which are only found in El Yunque. Some parts of the rainforest of still closed due to the impacts of hurricanes Irma and Maria. Clean up efforts are still underway. A driver picked me up early one morning from the Hotel El Convento, and dropped me off at a halfway point. Where I got on a bus with a group of people who had also signed up for the same excursion, from other hotels. 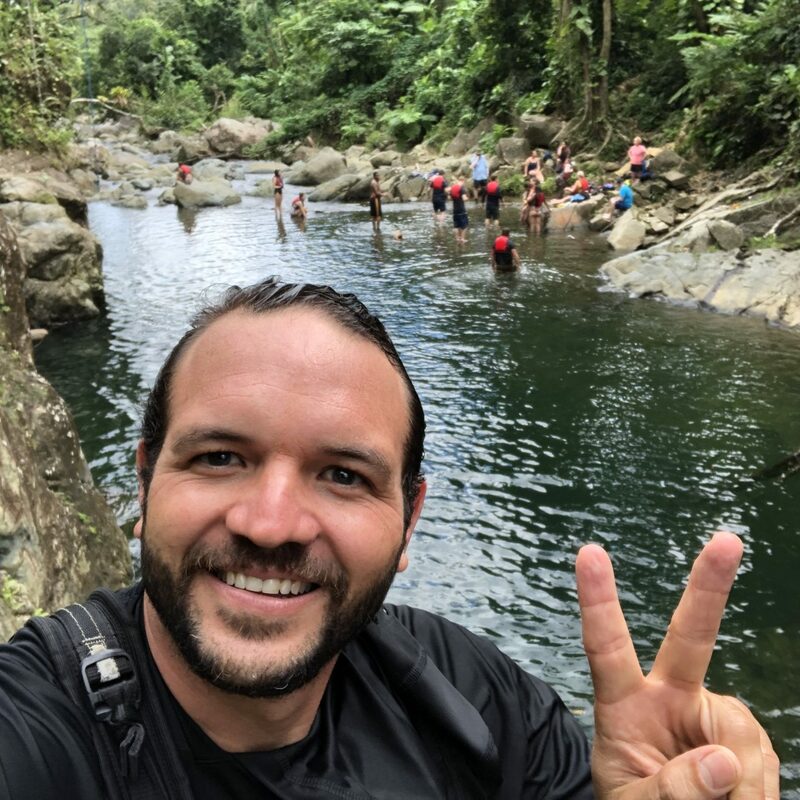 As we made our way to El Yunque National Forest our tour guide, Hector, who sat at the head of the bus introduce himself and his crew who would be guiding us along the way. 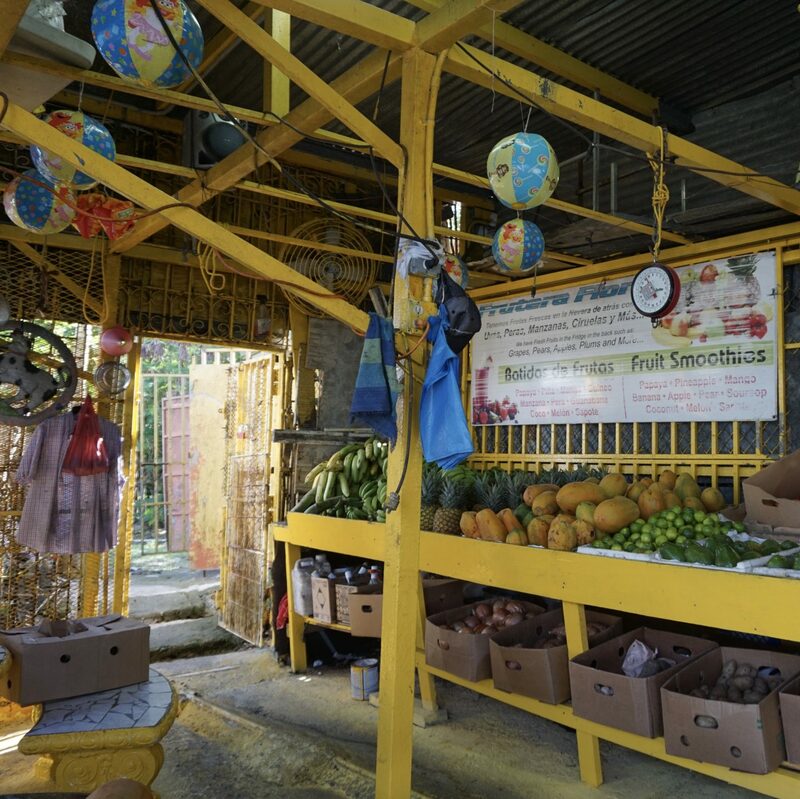 Before we got to El Yunque National Forest we stopped at a local farmers market for a bathroom break. While we were there our tour guides bought a variety of fruits for us to eat along the hike. After using the bathroom I strolled through the famers market and noticed that they sold hammocks. I’ve been wanting to get a hammock for my back patio for some time now. Needless to say I ended up buying a hammock. I can’t wait to hang it up. When we arrived at El Yunque National Forest, our tour guides provided us with bottled water and bug spray as a precation. 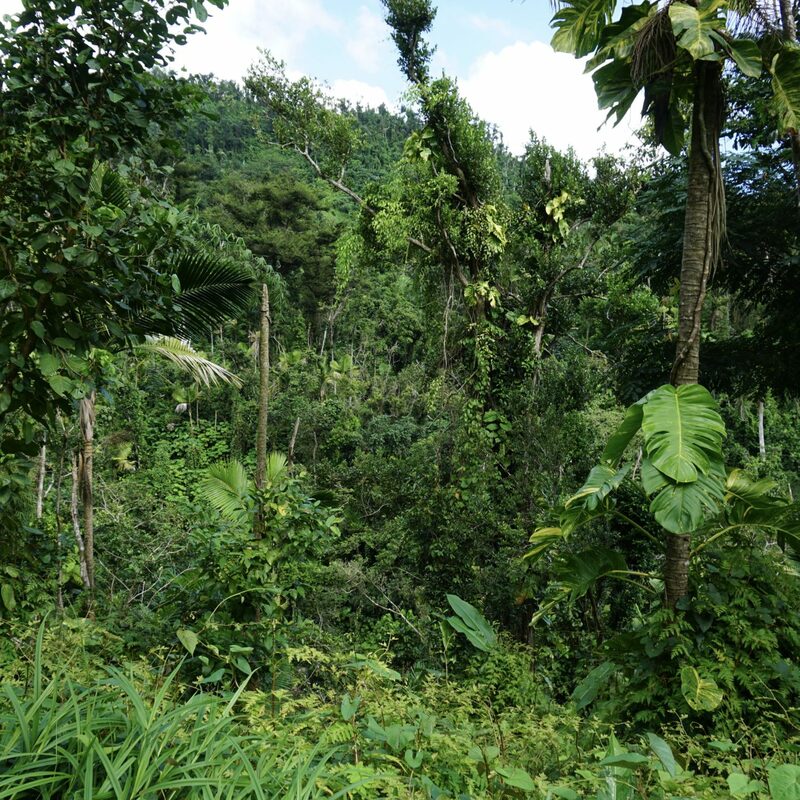 As we hiked thru El Yunque, Hector would stop along the trail and show us different types of plants and tell us what ailments they could be used to for. 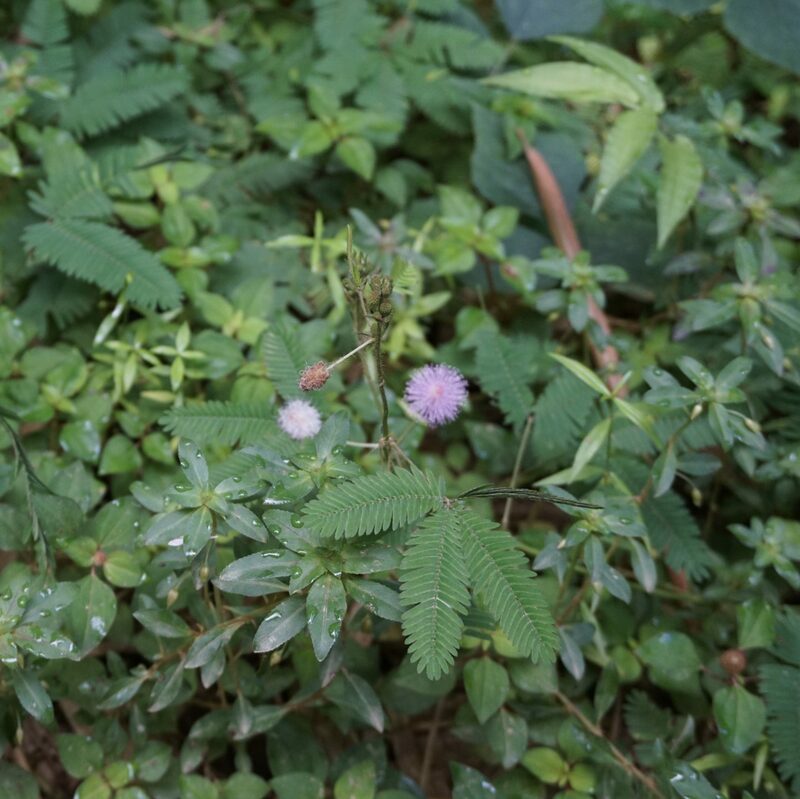 Among the plants that Hector showed us, the two most memorable ones were the touch me not plant and the blue fern. The touch me not plant folds its leaves inward when touched, I’ve never seen anything like it. It was really cool. 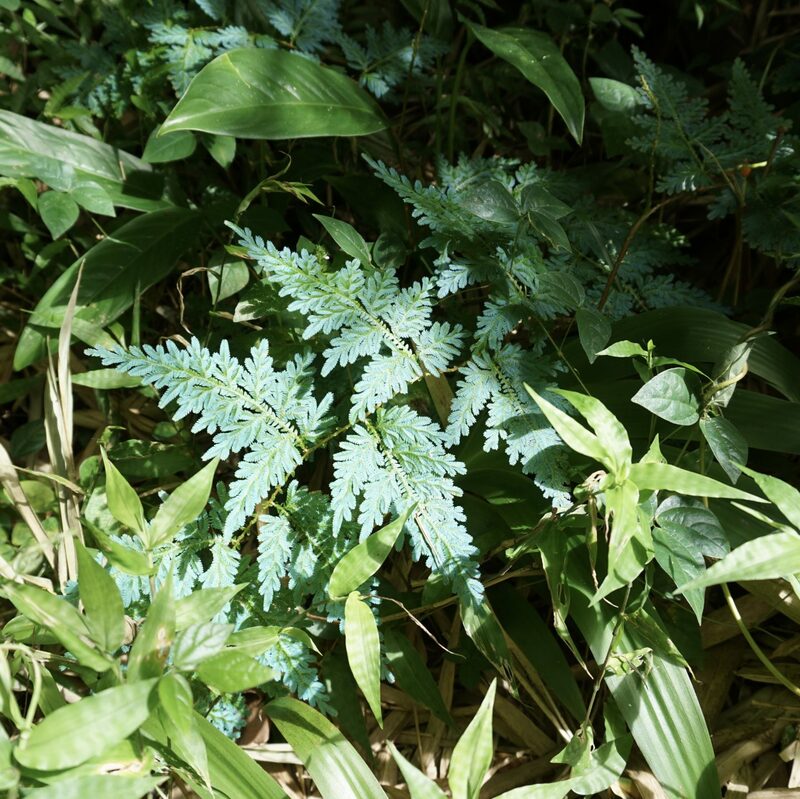 The blue fern is exactly just that a fern that is bright blue. After we hiked for a bit, the first stop we made was at a river bend. There was a waterfall in the far back and a rope swing in the middle followed by some rocks. Everyone immediately dropped their things and jumped in the water. The water was so cold but refreshing at the same time. Hector escorted a group of us up to the rope swing. He showed us how to position our hands and brace ourselves for the jump. It was so much fun. After I had jumped from the rope swing a few times I swam over to the waterfall. You could only get so close because the current would push you away. It was absolutely beautiful. As everyone made their way into the water and started to take photos. Our tour guides grabbed two massive leaves and began to cut the fruit they had bought at the farmers market on them. 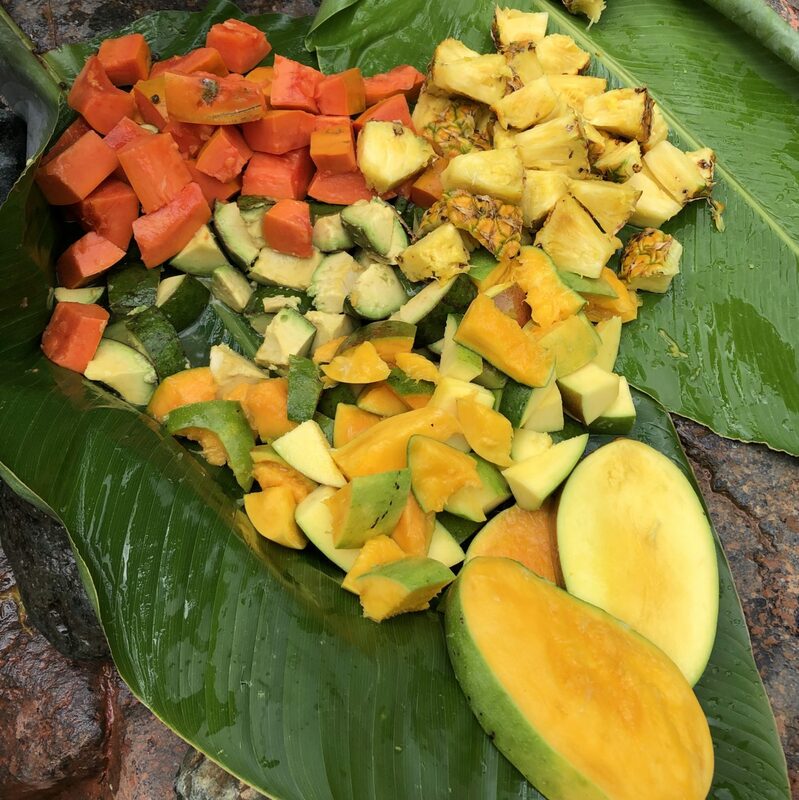 When they were done there was a beautiful fruit platter of pineapple, avocado, and mangos that we all ate from. Once we had eaten all of the fruit everyone got their things together so we could hike to the next spot. We came across two water slides along our hike. The first was a short one over a small waterfall. I enjoyed it because after you slid down you could swim under the waterfall against the rocks. It was a cool experience. The second slide required a bit more mastery. It was much longer and if you didn’t hold yourself upright it could be a rocky ride down. I mastered it after sliding down a few times. Cliff diving has been on my bucket list for as long as I can remember. After sliding down the second slide a few times hector made his way to the top of this cliff. He showed those that wanted to cliff dive how to do it properly. He told us how to position our feet and once airborne to place our body as straight as a pencil going down. If not we could harm one of our ligaments. I couldn’t believe I was going to get the chance to mark something off my bucket list on this trip. Once I got over the initial shock of the fact that I was about to cliff dive 25 ft. I made my way towards the ledge. As soon as my body was airborne and I positioned myself like a pencil, the feeling of being airborne and having no support took over. I looked down and immediately started screaming. Aaaahhhh!!! Then I hit the water and submerged with the biggest smile on my face. It was the most exhilarating feeling I’ve ever experienced. Every cliff and or rope swing we came across after that was a piece of cake to me. I would eagerly line up ready to jump when it was my turn. When it was time to head back to the bus, was when I realized that I was starting to get hungry. 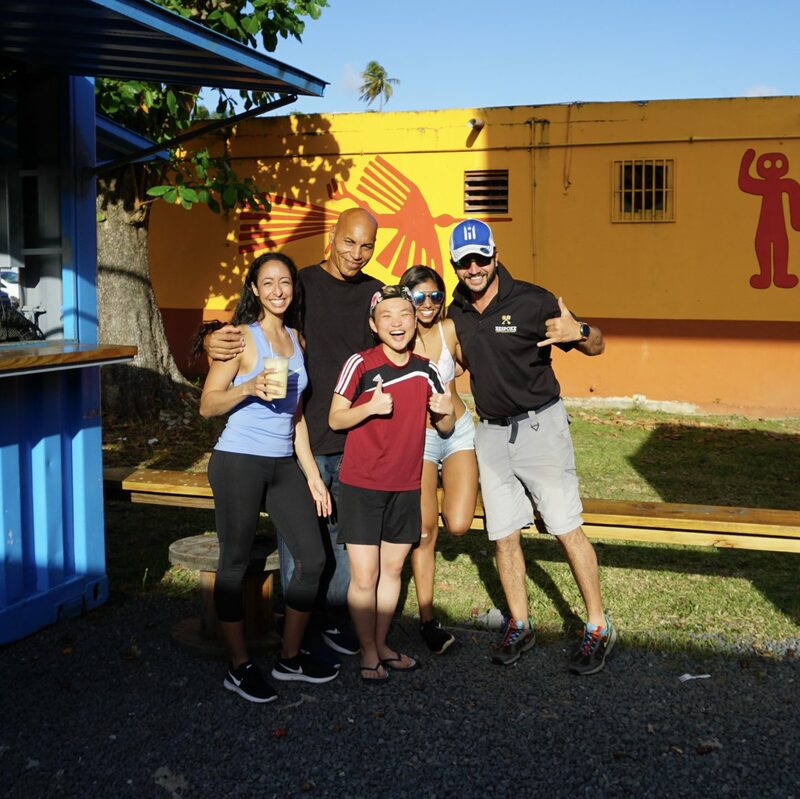 Our next stop was to the Luquillo Kiosks. The Luquillo Kiosks are a long row of buildings along the beach in Luquillo. You can find over 60 different kiosks among these buildings. Some of them sell souvenirs, others serve food and drinks. I ended up having lunch with some girls I met on the bus. We ate at a restaurant called Erruno, I ordered arroz con coco y pescado (rice with coconut and fish). Before we left we stopped by a place called the “Mojito Lab” and grabbed a mojito for the rode. Mines was flavored Parcha. I want to give a special thank you to Hector and his crew for guiding us thru El Yunque National Forest. You all helped make the experience that much more memorable. Hector would lead all of us while one of the tour guides walked along with us in the middle of the group and another guide stayed back behind us all. The guides communicated well and were always aware of where everyone was from our group. This was by far one of the most amazing excursions that I’ve been on and I would recommend it to anyone that goes and visits Puerto Rico. You have to go see El Yunque National Forest. I vlogged my entire trip. Check out the video below to see clips of El Yunque National Forest.